I love race day, it’s a brand new script being written before our eyes. At any moment, you don’t know what’s going to come at you next… What hiccups you’ll encounter? What kind of weather you’ll be faced with? Or, What kind of pain you’ll need to push through? So often it’s not “if something is going to happen,” but “WHAT is going to happen! ?” And as athletes we have to prepare the best we can and adapt our plans at any given moment. 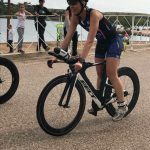 At Buffalo Springs Lake Ironman 70.3 I had some of the typical hiccups (no spray lube, goggles kicked off and a loose bottle I had to keep grabbing) but my real challenge of the day started at mile 42 of the bike course. 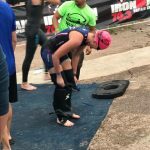 It was in that moment, with Gatorade splattered over my body and sweat dripping into my eyes, that I realized I wasn’t going to hit sub-3 hour bike split… and this started my downward spiral. I prepared both mentally and physically heading into BSLT, but the day brings what the day brings! The weather was a wild card up and down all week, but luckily turned in our favor with some of the best conditions we could hope for in west Texas for June. We drove the bike course the day before and reminded ourselves of the 6% inclines and tough switch backs we would face. As we drove, I was surprisingly calm and relaxed. I was the third wave off the beach with females 18-39. I started swimming faster than I normally would trying to draft with the front pack. We quickly swam up on the swimmers in the front groups, but made it around the bouys fairly easily. It was a calm day on the water and it wasn’t until the final turn when I ‘hit the gas’ again. Now, all the waves were mixed together and I couldn’t tell where I was positioned but my watch read 32 mins as I came out of the water – I was pleased with that! All our FTC peeps were there cheering as I hustled to my bike. In no time I was off to that first humdinger hill out of transition – granny gear all the way up! The first hills out of the park were already starting to burn up my legs and I got nervous… but as I warmed up I got into a groove. The sun was starting to shine down and reminded me to drink and hydrate. I set mental notes to eat at specific mile markers to break up the ride. 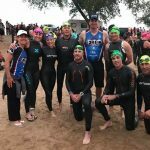 As I continued, I got passed by many of the girls who I was ahead of during the swim and plenty of the fellas in the wave behind us BLEW by…. Everyone passed me like I was standing still! 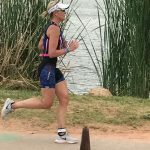 This really did a number on my confidence… but I kept it together focusing on my power zones and heart rate – sticking to my plan. The ride went fairly well and I was ticking away the miles. Then, as I hit the last major hill I realize I don’t have much left in the tank and fatigue washes over my body. I start to down Gatorade in hopes for a revival but I know that’s a far cry from helping. I hit the flat section back to town and the wind seems to increase like a mighty force pushing me backwards. 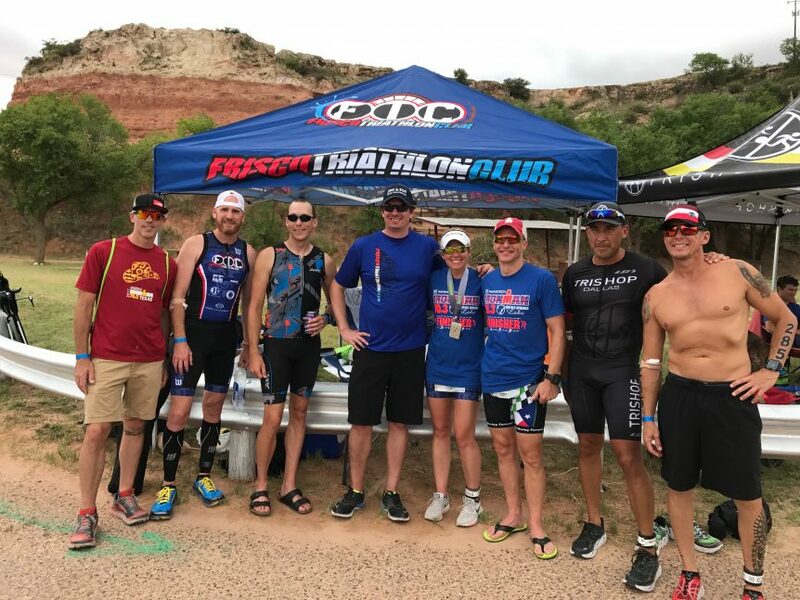 My heart sinks as quick math tells me I’m not going to make a 3-hour bike split — and not only that, but it was going to be close for me to even beat last years bike time of 3:08. Without realizing it, my speed slows and my body starts to let me down. I was getting in my head! I didn’t know if I had the legs to run, but I never do. I felt weak, disappointed, frustrated and my head was getting the better of me. I arrived back to T2 at 3:06 with jelly legs, a heavy heart and noisy head. With a quick transition and LONG Gatorade-fueled pee, I headed out on the run course without any expectations. I started the first loop simply running to feel – not allowing myself to look at my watch. I found myself get into a groove and even the crazy hill at mile 3 didn’t knock me out. I saw many friends on the run course – the lift was simply amazing! Then, mentally tough and as confident as I could be, I started out on the second loop. I hurt pretty bad now, but I knew this pain and was ready to push through and fight it. I didn’t look at my splits, but I’m confident my second lap was faster than my first. I finished the run in 1:42. I still don’t know how I did that coming off a challenging bike that left me weak in many ways, but it goes to show that the race is not over until it’s over! We must change, adapt and adjust our plans as we go. And we can’t allow hiccups, mid-race challenges or head games take us down! Mental strength can be the difference in winning and losing at any level – have you exercised your mental muscle? 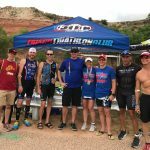 I finished BSLT 70.3 in 5:25:28. 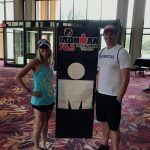 I learned later that I missed a roll down slot to 70.3 World Championships by one. Am I disappointed? You bet. But I’m more hungry and focused than ever!